Watching the 2016 Presidential Election is a nail biter with results coming in that I would have never thought could happen. We live in a democracy though. The winner is chosen by the votes, by the people. I was actually born the day George W. Bush was elected, November 7th, 2000, another very close election. Coincidentally, my older brother, Timothy, was born on Bill Clinton's second inauguration, January 20th, 1996. I guess you could say that we're quite a presidential family looking at it that way. This week, I also turned 16, an age I could have never imagined being since I was always the youngest. Although our days of birth align with important American dates, my brother and I weren't born here. The two of us, along with our parents, come from the Philippines. No matter how elections roll out, our government works here. It has its problems, but for the most part, it serves its citizens. The Philippines ins't like that. You're pretty much on your own in that country. It's suppose to be a democracy there, but the government is run by corruption and bribery. I absolutely love the Philippines; however, we left for many of those reasons. As much as you'd like to say our government has those same problems, it'll never even be a fraction of what it is where I come from. America is by no means a perfect nation, but I can't imagine living anywhere else regardless of the results of this year's election. On a chilly November afternoon, I'm representing the style of men's dapper fashion. Luckily, I'm quite warm in these three layers I've assembled today. 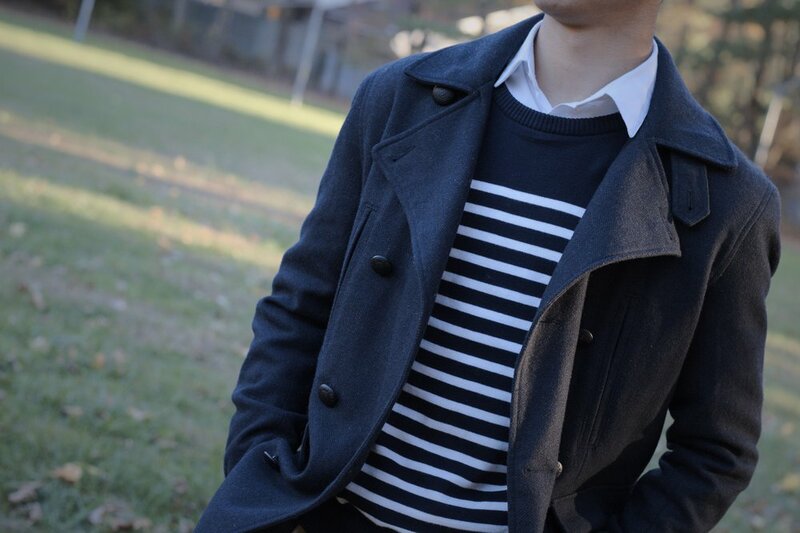 It begins with the outer black pea coat, something I've been dying to wear since Autumn started. Underneath is a white shirt, an essential for any man, and a navy striped sweater to rock that sweater look. I chose those two pieces since the the whites of both of them conform to each other in the full outfit. Next, I'm wearing a pair of men's beige chinos and brown leather derby shoes. For my New Jersey fashion and teen fall fashion today, I've created a look that's surprisingly comfortable in this colder weather but quite dapper for any special fall occasion. Photos by Jackie Oleynic Photography. Check her out here.